We are seeking articles for the December 2011 – February 2012 issue of Australasian Plant Conservation (APC), the bulletin of the Australian Network for Plant Conservation (ANPC). The issue will be on the theme ‘Monitoring and plant conservation’. Monitoring is an important aspect of plant conservation work, providing data to assess changes over time and allowing people to make informed decisions about management practices, and make changes to those practices if necessary. In this issue we want to look at the objectives of monitoring, what should be monitored and how, and how we can keep monitoring simple but effective. We are particularly interested to receive articles related to specific examples of effective monitoring of the outcomes of on-ground plant conservation activities, monitoring vegetation condition, and long-term monitoring, and to learn of the insights/lessons for those about to embark on their first monitoring program. Articles generally should not exceed 1200 words and authors are encouraged to submit two or three high resolution images to illustrate their article. • details of relevant publications, information resources and websites. Deadline for submissions for the December-February 2012 issue is Friday 11 November 2011. Guidelines for authors about the APC style and scope are located on the ANPC website. 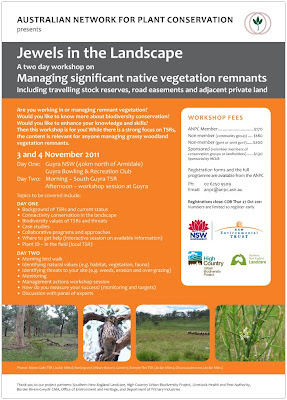 The Australian Network for Plant Conservation (ANPC) is holding a two day workshop for anyone involved in the management and conservation of Travelling Stock Reserves or managing remnant vegetation such as road easements and adjacent private land. 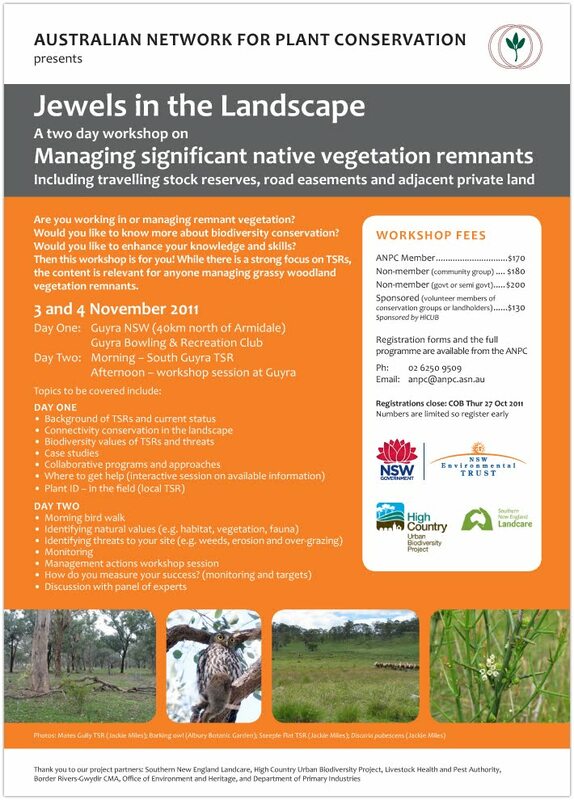 ‘Jewels in the landscape; Managing significant native vegetation remnants’, runs from Thursday 3 November and is designed to assist rangers, landcarers and landholders, catchment groups, government agencies’ staff and all those wishing to improve their knowledge and skills in biodiversity conservation. Workshop facilitator, ANPC’s Sue Mathams, said remnant vegetation on Travelling Stock Reserves (TSRs) is the key habitat for a range of threatened species and often contain endangered ecological communities. In many areas they are the only remnant vegetation and provide connectivity and refuge throughout a primarily agricultural landscape. “The two-day workshop includes a background on TSRs and exploration into the values and threats of the ecological communities they contain. It also provides the opportunity to undertake plant identification in the field at South Guyra TSR and a hands-on session of vegetation monitoring techniques,” she said. Presenters include Dave Carr of Southern New England Landcare (SNELCC), Department of Primary Industries’ agronomist Clare Edwards and Chris Nadolny from the Office of Environment and Heritage. “As well as learning from these experts in their field participants, enjoy the benefits of connecting with a range of stakeholders,” Ms Mathams said. ‘Jewels in the Landscape’ is supported by a NSW Environmental Trust grant and workshop fees begin at $170 for ANPC members. A number of places offering a $50 discount to volunteer members of a community, environmental or NRM group are available upon application, sponsored by SNELCC’s HiCUB project. The two-day workshop runs from 8.30am – 5pm Thursday 3 November and 8am – 4pm Friday 4 November at Guyra Bowling and Recreation Club and includes field trips to a local TSR. For more information, including to view the full program, or to register please go to the ANPC website or email anpc@anpc.asn.au.